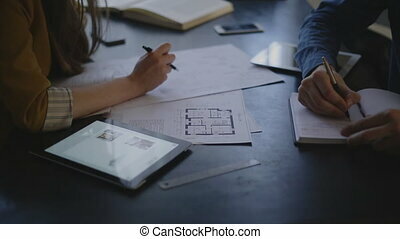 Video customer and the executor of the order for the construction sit opposite each other and discuss the subject of the order, are actively working with papers, drawings. each has its own subject for the record, it is an electronic tablet, it has a paper notebook. on the table an abundance of electronic devices: tablets, phones. warm light in the room and the cold from the windows give a soft image and excellent depth of field. man takes notes in her notebook. Three young men sitting at the table discussing something depicted on sheets of paper. These are two beautiful girls and a guy. 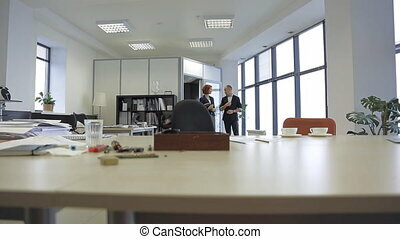 They are students or colleagues who are planning a project or discuss the results of the study. One girl has long dark hair and a plaid shirt, the second is blonde, she gestures, her face has a lot of emotions. They look at each other, show some notes and ask questions. They sit in the office, behind them the shelves with folders and books are visible. 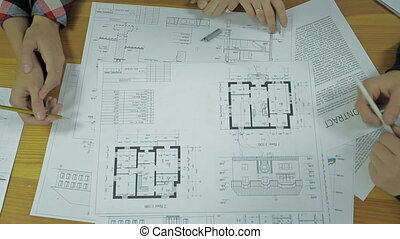 The two architects are correcting the blueprint in their office. 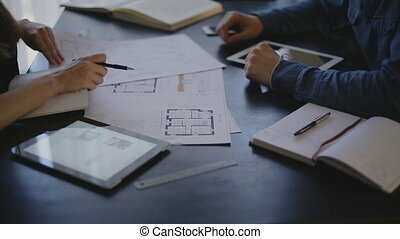 The man and woman are sitting at the table with papers on and completing the scheme with their pens ans pencils. The lady is drawing the line and explaining her point and man is agreeing with her. Two financial analytics are working together in the office of their start-up. Woman is sitting at the table and researching digital currency market using reports. And her male colleague is comming to ask her advice about graphs on the papers. Young woman smiling and gesturing, explaining something to a girl and a guy. She is beautiful and trendy, wearing a black and white suit, she has a necklace, bracelet and rings. She examines some papers on the table, shows something by her hand. Beside her a girl with dark long hair in plaid shirt and the guy in blue sweater are sitting, they look at each other, laugh, ask questions or make any comments. They look like students who prepare a course project. Behind them the shelves are standing. Head of young promising to ask subordinates for performance analysts from previous periods it is dissatisfied and expresses its appearance is. Near charts and graphs, market analysts securities and financial instruments, seasoned professional, productive atmosphere of confidence. sitting in front of her young male and female managers, to discuss financial results for the annual reporting of sales and analytics, sitting at a wooden table and a large exchange with the boss offers. Beautiful hispanic woman in the office with his hipster male expert financial adviser during the meeting, the two sit at the large wooden table on the table a few charts, annual reports, and the state of the money in her account, deposit, electronic purses, represented shares and falling demand. Nearby is a tablet, a laptop and a lamp. She wore a loose modern, feminine shirt. discuss the solution of the active financial flows.